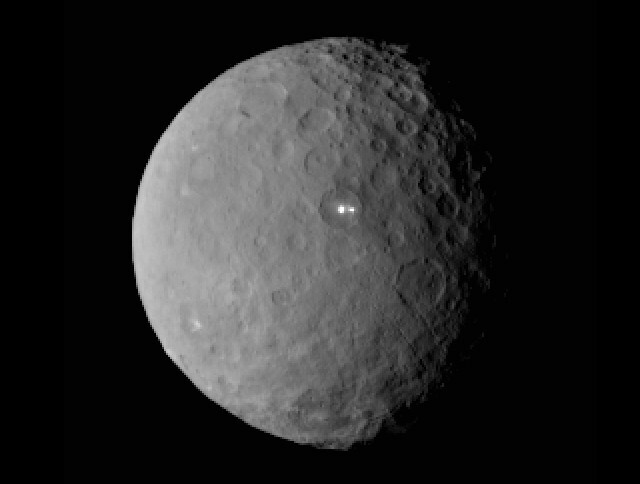 NASA confirmed that its space probe Dawn regularly entered the dwarf planet Ceres’ orbit. It was at an altitude of about 61,000 kilometers (about 38,000 miles) when it was captured by the Ceres’ gravity. This happened yesterday but Dawn was on the hidden side of the dwarf planet when it entered its orbit. The consequence is that it took a bit before the probe reached a position where it could transmit data to Earth. The Dawn space probe is the first to enter a dwarf planet’s orbit. It’s also the first to orbit two celestial bodies as in the past spent a year around the giant asteroid Vesta. Despite some problems, now Dawn reached Ceres and there it will spend the rest of its mission, which is expected to go on until at least June 2016. The duration of the mission of the Dawn space probe depends on the availability of hydrazine. To travel to the asteroid belt between Mars and Jupiter to Vesta and then to Ceres, Dawn used an very efficient ion engine. It’s also equipped with a system of reaction wheels that serve to orient it towards the goal of its analyzes with great precision. Unfortunately, two of these wheels have failed over the years forcing NASA to use the hydrazine thruster to orient it towards the desired position and to maintain it. The reaction wheels could be powered by solar panels so they can be used as long as they work. The use of the hydrazine thruster can continue only until it runs out of fuel. This means that NASA will have to try to plan carefully the work of the Dawn space probe to optimize the use of the precious hydrazine. Dawn’s instruments, in part made by NASA and in part by the Italian Space Agency and the German Space Agency, will study the dwarf planet Ceres as long as possible. Because of its distance, it really took the arrival of a spacecraft in its vicinity to get to really know it. Like Vesta, it’s a kind of fossil from the dawn of the solar system’s history and that’s the reason for the name Dawn for the space probe. Now the Dawn space probe will start studying closely the dwarf planet Ceres with its mysteries. The strange white spots recently discovered are just one of them. The data of this mission will be analyzed for years, which means even well after its end.